"how do we involve the USA in a war?" "we must control the state department." "we must take over and control the diplomatic machinery of this country." to president wison, "cationed him to see the war did not end to quickly." "prevent a reversion of USA, by controling education"
carniegi, "counter act the colonies leaving great brittain"
9/11/91 "a million points of light"
Brent died this day in Degihistory 16 years ago. Mydland died of a drug overdose after taking a speedball at his home on "My Road" in Lafayette, California, on July 26, 1990, shortly after completing the band's summer tour. It was hardly a tell-tale sign of trouble, but on August 9, 1929 Wall Street got an inkling of the upcoming crash as the New York Bank raised the rediscount rate on loans to brokers a full point to 6 percent. The hike was precipitated by the unsettling news that brokers had racked up a record $6 million debt, the fourth time during August 1929 that their loans had swelled to record levels. Still, bankers assured the business community that the move, which was the biggest raise to the rate since the close of World War I, wasn't cause for alarm. Soothing words aside, reports from the day note that the new rate did indeed catch Wall Street by surprise. The following day the DOW dropped 14.11 points to close at a month-long low of 337.99. Until that point, investors had been reveling in "Big Bull Market," a record-setting run which was well over a year old. As the DOW hit new highs, the stock market became a national past time; the craze for playing the stocks spread from being the sole province of the big-city elite to a part of the daily life of small-town America. However, as the Reserve Bank's move to advance the interest rate oh-so-subtly suggested, the good times were based on speculation rather than solid financial practices. By November 1929, this quiet hint at a downturn in the market would look more like a prophetic warning call. Perhaps the most awesome display of the tides on our planet occurs at Cape Split, on the southern side of the entrance to Minas Basin (Cape Split may be reached by a pleasant two-hour walk along a popular hiking trail from the village of Scots Bay, which is a 30-minute drive north of Wolfville). Here at the time of the mid-point of an incoming tide, for a considerable distance the forest on the towering cliffs is filled with a hollow roar produced by the turbulence of the waters surging over the submarine ridges below. The currents exceed 8 knots (4m/s), and the flow in the deep, 5 km-wide channel on the north side of Cape Split equals the combined flow of all the streams and rivers of Earth (about 4 cubic kilometres per hour). Three hours later the spectacle pauses, and then begins flowing in the opposite direction. I have waited quite some time to continue this thread by relaying this post, for this is a day in history for which I have much reverance. On this Day in 1776 we learned the power of new media medium. Though the printing press had been in use since the mid-15th century, it was on this day we would see the full potential of this invention. It was on January 10th, 1776 when the world discovered just what reaching the masses can accomplish. fore today is the anniversary of the first publishing of Thomas Pianes' Common Sense. The print shop which first published "Common Sense" is now a parking lot on third street next to St. Pauls Episcopalian Church (which itself is no longer a church but a community center). 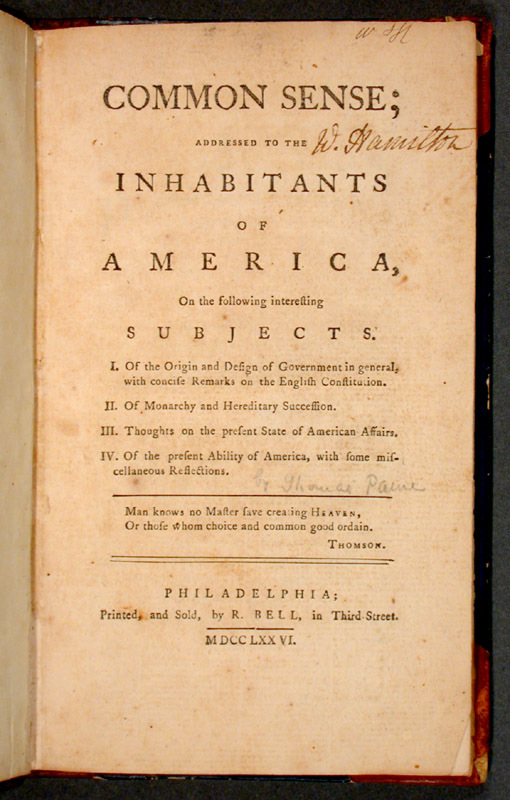 Located right across the street from the first commodities exchange in the US I am sure thomas paine had some pissed off people reading this first example of civil disobiedience via pamphlet. Dr. James Bedford was a psychology professor and member of the family that founded Bedford, Massachusetts. He was cryonically preserved (frozen) immediately following his death on January 12, 1967 in Glendale, California at age 73. He is credited with being the first person frozen with intent of future resuscitation. In May 1991, his body's condition was evaluated when he was moved to a new storage place. Syed Ahmed Khan was an Indian educationalist and politician who pioneered modern education for the Muslim community in India by founding the Muhammedan Anglo-Oriental College, which later developed into the Aligarh Muslim University. His work gave rise to a new generation of Muslim intellectuals and politicians who composed the Aligarh movement to secure the political future of Muslims in India. One of the most influential Muslim politicians of his time, Sir Syed was suspicious of the Indian independence movement and called upon Muslims to loyally serve the British Raj. He denounced nationalist organisations such as the Indian National Congress, instead forming organisations to promote Muslim unity and pro-British attitudes and activities. Sir Syed promoted the adoption of Urdu as the lingua franca of all Indian Muslims and mentored a rising generation of Muslim politicians and intellectuals. Although hailed as a great Muslim leader and social reformer, Sir Syed remains the subject of controversy for his views on Hindu-Muslim issues. whenever government and religion exist on the same level nothing but hatred, malice and violence will stem or insue. Any Muslim movement should be squashed and supporters put in albu grave or Gauntanomo Bay; that's why we have these places. to inprison those who can't exist in society. Got the CD in the mail but it didn't survive the trip across the country. Thanks for the suprise. Would you be able to send another? I think maybe a little bubble wrap would help it along. Got your message a few weeks ago. Sorry I wasn't able to catch you. Missing the sandwich drops on Market street. Let me know how you are doing. Highly recommend for those world music lovers out there a guy named Nusrat Fateh Ali Khan. On March 8, 1973, he was found dead at age 27 of a gastrointestinal hemorrhage at his home in Corte Madera, California. Pigpen is buried at the Alta Mesa Memorial Park in Palo Alto, California. 17 years ago The Grateful Dead where in DC awaiting the start of the 1990 spring tour. The shows at the capitol center in Landover, MD sparked the notion that Jerry was clean, the band was well rested and practiced and that maybe, just maybe the next decade of Live Dead would be less treacherous then the 80's had proven to be. Spring '90 certainly would leave us all hoping for what was not to be. Great first set. The three nights in feb they spent warming up prove to pay off as the spring tour '90 will be one to remember. First set they play "Loose Lucy" for the first time since 10-19-74. Crazy Fingers to open the second set and a lovelight closer highlight eras gone by and really get the crowd going. great show, a must for any "head"
This has been released as "Terrapin Station" It was Phil's 50th birthday (his 67th is tomorrow). Almost ten years since brents tune "easy to love you" was played and a solid five since they broke out revolution. Typical first set smoothly rolling. Nice Let the good times roll opener into a touch of gray run through. Then tucked into the last twenty minutes of the first set is the first Balck Throated Wind since "The Retirement" shows in october of '74. Booby gives it a good rendition with a slew of new lyrics and a nice throw back to the 70's to whip up even more hype for the first tour of the 90's. e all know what happened over the next five years but just listening to these shows from 1990 leave you wondering what could have been. also 3-18-77 is the one and only "full" version of Terrapin Station ever performed. Quite a week for the boys; no matter what year it is!! This is also Pi Day. 3-14. 22/7 is 3.14 so maybe those 7 unsold shares should be kept unsold. Dr., why don't you go bck to last week's RESTORE POINT on Windows? UNOCLAY: If you guys can't come up we will come down. My only window until Chuck's Fall is tonight tomorow or next thurs and friday. Can we play at Danger Danger too?